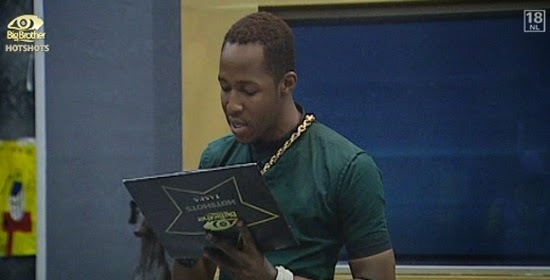 Big Brother put Idris straight to work as Head of House, summoning him to the diary room to hand over the envelope with this week's theme. Idris headed back inside and called his fellow housemates into the lounge where he read the contents of the envelope. The theme for this week was to be comedy. Hotshots would be tasked with developing skills in several styles of comedy, which would include amusing songs and comedy skits for the task presentation on Wednesday. The housemates would receive various props from Biggie to use for the task, and they could be sure of a few twists and turns as well. Everyone was very excited about the new theme, but mourned Arthur's departure, saying he would have loved comedy week. Yet again, the confident Hotshots wagered 100% on their task coming to an agreement a lot quicker than the previous week. It seemed they were very confident that they could get their fans rolling with laughter. But seeing how much they love cooking and eating, it was no surprise they were prepared to risk everything for the chance to do a lot of luxury shopping on Sunday. Idris was very happy, saying "This week is my week." He had just won Head of House and now he would have a chance to brush up on his comedy skills. It will be interesting to see who shines at comedy this week now that the resident comedians, Arthur and Sabina, are gone. Who do you think will turn out to be the funniest Hotshot?